April 2017: Sniffling, Sneezing & Itching, Oh My! 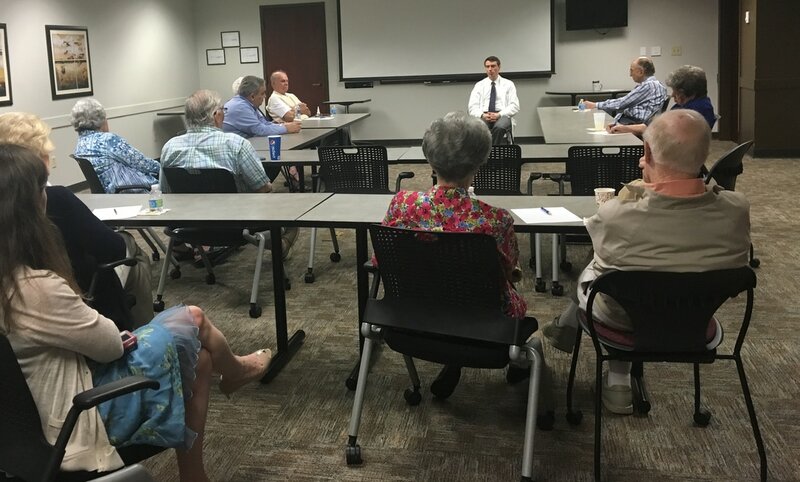 Big thanks to our April guest speaker Dr. David Redding of Redding Allergy & Asthma Specialists for a enlightening and informative discussion! We learned that allergy season in Atlanta is a lot like traffic in Atlanta: There is very little time that it isn’t in full swing! Let's clarify the difference between an allergist and an ENT. An allergist in a medical doctor who specializes in the medical management of nasal inflammation, asthma, and food and environmental allergies. An ENT is a medical doctor who specializes in structural problems that can be corrected surgically. Many times the two specialties work together to come up with a diagnosis and plan of treatment. The good news is there are many methods to treat nasal/seasonal allergies! Start with over-the-counter oral medications as well as nasal sprays. If you find no relief, it’s time to see your doctor who may refer you to an allergist to be evaluated. In addition to what is growing and blowing outdoors, we also need to be wary of dust mites indoors! Dr. Redding suggested products such as allergen-barrier bed and pillow coverings and referred to two online companies, Achoo Allergy and Mission: Allergy, that sell such products. Penicillin allergies from childhood are rarely a problem as an adult. Many adults still have "PEN ALLERGIC" noted in their medical record as a result of reaction as a child. However, most likely this is no longer the case. This could create a problem, as it limits the patient to antibiotics that are not as effective, especially when hospitalized. An allergist can do a very simple in-office, non-invasive test to determine one's current reaction to penicillin, and this test is covered by insurance most of the time. Venom allergies (from ants, bees, hornets, wasps, etc.) are a huge problem for many people that often result in ER visits, hospitalizations and sometimes death. Insurance covers desensitization to venom (at different levels -- one would need to check with their carrier). It might just make enjoying the great outdoors less stressful.